Revisiting the analyses of the Russian and London Ambassadorial interpretations of garishness from a triumphant summer now dwindling into damp autumn there follows a brief methodological retrospective on our articulation of the sartorial codes. Roman Jacobson’s communicative functions are a most useful way quickly and effectively to audit the different thrusts within the uniforms discussed. This analysis will also reveal in more rigorous terms how and why there are two types of garish that are actually quite diametrically opposite in their rationale and efficacy but that both work quite successfully. Jacobson wrote that there were six elements in each communication situation and six functions that accounted for them. Let’s look at the two sets of uniforms individually in the light of this model. With ratings out of 10 for utilisation intensity of specific functions. Hopefully this short analysis shows the power of semiotics in revealing nuance and savvy underlying what looks like mindless cacophony in two types of Olympic garish. Interestingly, these versions of garish work in almost diametrically opposite ways. The London Ambassadors’ uniform has a low emotive (does not communicate London in any way) and poetic function (hotch potch of signs) while the Russian Federation uniform scores very highly on both emotive and poetic functions. Both of the uniforms privilege the phatic but the former stresses unthreatening bonhomie to addressees whereas the latter plays a subtle gambit for Russian power to assert itself in a multi-polar world. 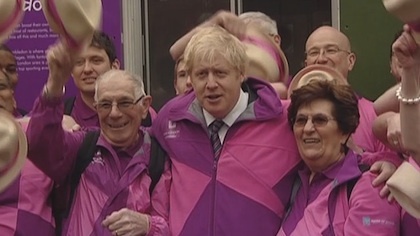 So, in conclusion, we saw these two types of garishness at London 2012. Both were designed to project soft power but one did so (perhaps unwittingly) through the lack of design in its composition but with a universal recipient in mind. The other seems like the result of emotive nationalism, is highly indigenous and poetic in composition, was created to make an aesthetic statement flying in the face of international pundits. You are currently browsing the Semionaut blog archives for October, 2012.